Sweet Child Solos is a performance/installation inspired by a radiophonic anomaly that I experienced while driving on a hilly highway in 2005. On the hilltops, my car radio picked up a distant news station on which I heard a story about Cindy Sheehan, the mother of an American soldier who was killed in Iraq. Sheehan was protesting the war by camping outside President George W. Bush’s Texas ranch. In the valleys, I heard a local college radio station that was playing an a capella cover of “Sweet Child O' Mine,” a romantic ballad by Guns N' Roses. Since then, whenever I hear that song, I think of the soldiers and civilians killed in Iraq and Afghanistan. Sweet Child Solos began as an evening event at LACE, a nonprofit gallery on a seedy stretch of Hollywood Boulevard, during which several guitarists performed instrumental covers of the song "Sweet Child O' Mine" by Guns N' Roses. 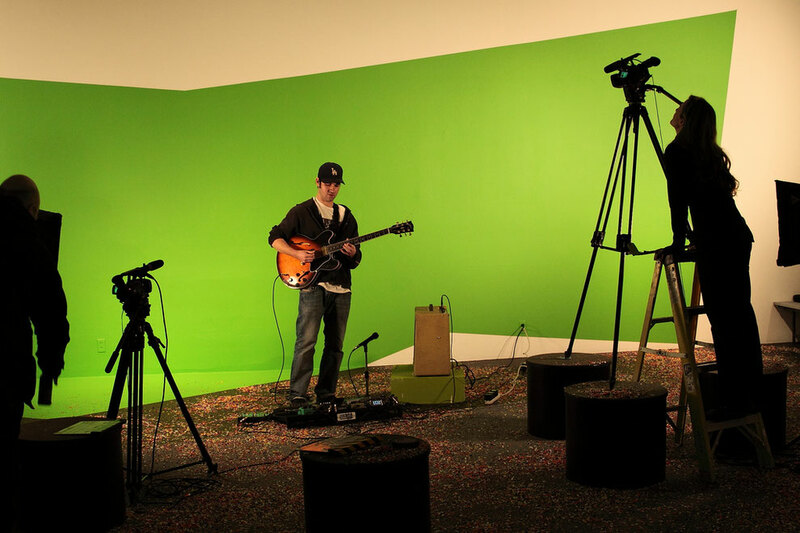 Their performances were videotaped in front of a green screen wall painting. 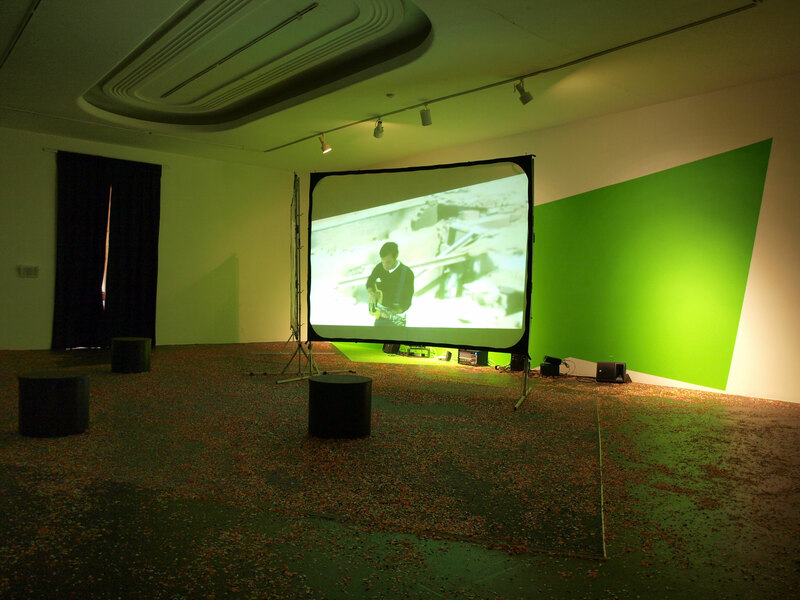 The gallery floor was covered with paper confetti. Two days later, video of the performances was projected on two screens. On one screen, the guitarist was superimposed over a still from a video of returning U.S. military caskets--the ﬁrst such video released by the military since 1991--depicting a truck onto which the ﬂag-draped caskets were loaded after being removed from an airplane arriving from Afghanistan. On the other screen, the background image was a video-still of the site of a US airstrike that killed 76 Afghan civilians. In this performance/installation, as in the Port Huron Project reenactments and the conflicts depicted in The Dystopia Files, the production of archival material plays an important and visible role in the event itself—documentation is an integral part of the spectacle it records. Staging musical performances at the site of the installation formalizes this reflexivity. *Borrowed loosely from John Lennon and the Invisible Committee. Josh Aster, Andy Robert Crouch, Terri Dewhurst, Josh Gerowitz, Davin Givhan, Michael Grodsky, Sho Halajian, Liz King, Sulinh Lafontaine, Andy Manoushagian, Mike Rios, Marc Scarpa, Sarah G. Sharp, Geneva Skeen, Carol Stakenas, Jennifer Sternad, Paul Wallace.